Executive Summary: it has been 18 years since the last baby was born, and no one knows why. The entire world, save Britain, has fallen completely apart. Theo is a burned out activist-turned-bureaucrat who is roped back in by his ex, And becomes the protector of the last hope of humanity. 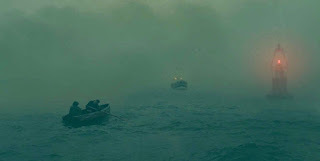 Dystopian Visions: The first thing you notice about Children of Men is that it is not a *pretty* film. This is most certainly by design, but absent are any bright colors or suggestion that anyone is, in any way, happy or satisfied, even those ostensibly in control. Even at the points where the excess of the ruling class is shown, a bare splash of green and red is the most they are allowed. Throughout, the camera lingers, wanders, to the periphery, allowing us to take in the world around (depicted in the header image of of the post introducing this series). That world is indeed ugly, bland, and hopeless. This isn't just communicated through exposition, or the visuals, but through what *isn't* there. Where a good deal of movies would feature swelling music informing our emotions, this leaves silence, allowing the movie to speak for itself in a raw, coarse tongue. Children of Men goes out of its way to make sure that you, the viewer, know that hope is pointless in the world, and it immerses you in that world until you feel that hopelessness in your bones. Utopian Undercurrents: In light of the above, it would be very easy to write off this entire section. There is no brightness, no light, no hope. It is everything a Utopia is *not*. Allow me a brief aside. I, generally speaking, detest political books. Not books with a political message, mind, but books (ostensibly) by politicians, used to prop themselves and their careers up. There was one, though, a few years back, by a young senator of whom you may have heard, called "The Audacity of Hope", and that phrase fits this movie to a T.
Because in the dimness of the world presented here, hope requires courage and audacity. Theo, as a protagonist, personifies this. Burned out and cynical, he comes to have hope, even when there is really very little to base that hope upon- besides his courage. Yet he, and the few with him, hold to that hope, audacious though it may be. Level of Hell: Eighth. For my money, this is as bad as it gets. Potentially worse by going to, say Mad Max levels of everyone-is-starving-in-a-desert, but this is 1984 levels of corruption and hopelessness. Legacy: 100. A+. Fire emoji. There are more important and influential *books*, to be sure, but for movies? Very little comes close. In Retrospect: Children of Men is a movie that is receiving a fair amount of attention these days. The cinematography is being recognized for its brilliance, but viewed through the lens of 2017, it becomes impossible to ignore. In 2006, it was good movie. In 2017, it is essential. I could go on for thousands of words, but watch it, and then watch it again. The smallest details, the word choices, the phrases and ideals we are seeing day after day all stand with stark clarity in a dim world.